My father loved painting lotus. Every birthday he uttered poems and brushed lotus: Sunny lotus, rainy lotus; thousand arrangements at sunrise or sunset; creating an overabundance of beauty. After dinner he often sat with my mother in a little garden house playing chess, both looking elegant and sublime like a celestial couple. He taught us Confucius and Mencious Doctrines. He was strict with himself, tolerant of others. He followed Mencious’ sayings “Not corrupted by riches, not withdrawn on account of poverty, not bent by authority, those are big heroes”. And he followed Confucius, “I examine myself three times a day. Do I work for people but am I disloyal? Do I make friends but am I distrustful? Do I instruct but not practice?” Father’s words and deeds were endless models for us. He lived a simple, thrifty, but fruitful life. He managed things with order. He never envied nobility; never craved for fame or profit. He taught Madame Chiang painting for 14 years with respectful quietness. In short, he maintained that one’s stature rests with one’s inner worthiness, and he always felt satisfaction from everything, together with a grateful heart. He lost his father while young. Three fires destroyed family property. At ten he suffered a severe head injury. Nevertheless he studied hard regardless of all those tribulations. He encouraged himself with the motto, “Deep and deeper sufferings make higher and higher persons”. He sought progress endlessly and his talents overflowed. He traveled over mountains and rivers to associate himself with poets and literates. They called him “Southern Genius!” At 14 he was already famous in Shanghai. 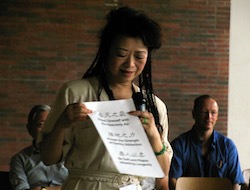 At 18 he became a professor at Beijing Yu Wen University and School of Arts and Literature. At 25 he was head of the Arts Department, Shanghai Fine Arts College and an instructor at the Literature Department, Kee Nan University. 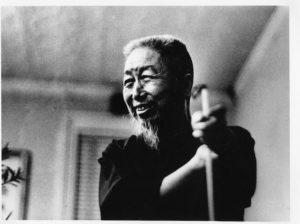 he was a poet, calligrapher, painter, martial arts practitioner, and a Chinese medical doctor. He grasped every opportunity to learn and linked all those different kinds of knowledge together with intricate understanding. He excelled on every subject. My countrymen called him “An Elder with Five Excellencies‘”. (Poetry, calligraphy, painting, martial arts, and medicine). My father was well versed in Chinese Traditional medicine. He was a student of then famous Dr. Sung You An. He studied the subject intensely, finishing in only two summers. He often treated the indigent free of charge, and even paid for their herbal medicine. He served the Chinese Army as a volunteer doctor. 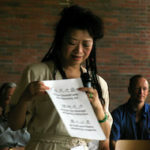 He was so good in medicine that people dubbed him “One dose Cheng”; “When the medicine comes, the sickness is gone” I well remember several big wooden plaques that people carried on their shoulders to our house, to honor his medical benefits to others, including one painted by the famous artist Mr. Wu Chang Shuo entitled “Skill with Kindness”. My father treated Yang Chen Fu’s wife who had been sick for a while. She recovered well and Mr. Yang was very grateful. 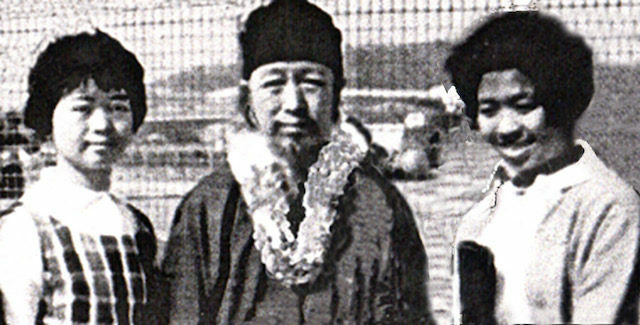 Now Mr. Yang was of Yang’s lineage, a renowned Tai Chi family. He accepted my father as his “House disciple” and taught him all of the principles of Tai Chi Chuan. My father, realizing Tai Chi’s health benefits, did not want to keep the secrets to himself. He promoted the martial arts, as a way toward physical fitness, publicly and widely, aiming to make all of China stronger by teaching everybody to practice Tai Chi. He taught us, his children, concentration, moderation, and perseverance through Tai Chi. When he went to France to display his paintings, he took the opportunity to introduce Tai Chi, “The Pearl of the Eastern Culture” to the West. He did it with his universal love to mankind. He continued expanding the martial arts in America, making it a world-wide undertaking. he was a good, law-abiding citizen. His whole life he was altruistic, promoted principles, and took part in community services, intent on helping all of mankind. On the nationwide political field, he declined a senatorial offering, merely accepting an assemblyman’s position. He loved my mother with all his heart. He was so sweet and tender to her! In poetry or in conversation he praised my mother: her virtue, her beauty, her elegance, her wisdom, her self-taught knowledge, her foresight, and her aloofness from worldly success. He really thanked Heaven for giving him such a heavenly companion. He was devoted until they were parted by death. He loved his children, loved his friends, loved the people, and loved God who created the Universe. After hearing this, Father was delighted and said “Good . Since you already know whom you believe in, and He is mentioned in the Bible, you are not being superstitious. I approve. But remember this: Your future husband, your lifelong companion, must also believe in God. Only through this union of mind and spirit can you two be tied together. I believe there is a God, but I regret I do not have time to study the subject of faith deeply”. Thank God! I know when I described my true belief to my father, the Holy Spirit was with him. “The fear of the Lord is the beginning of knowledge…..” Proverbs1:9. Academic study, family management, careers, and faith. In all of these, he was the model across the century. I once was and still am proud of my birth father. Now I am proud of my Heavenly Father. He embraces every one of us with his infinite love. Anyone who comes before Him can fall into His embrace, becomes His beloved child, and inherit the gifts He prepared for us before He created the world. 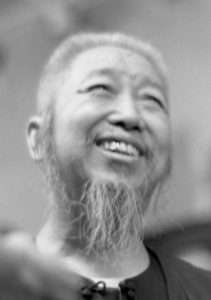 Cheng Man Ching’s way of teaching (4): On being a masterCheng Man Ching’s teaching was marked by underlining sameness and diversity at the expense of hierarchy and difference. This approach formed the basis of his unique way of bridging the cultural gap between East and West.